* Annual estimated passenger usage based on sales of tickets in stated financial year(s) which end or originate at Ash from Office of Rail and Road statistics. Methodology may vary year on year. Ash railway station serves the village of Ash in Surrey, England. The station is served by South West Trains, who manage the station, and by Great Western Railway. 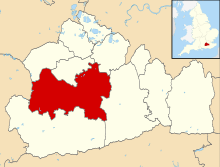 It is situated on the Ascot to Guildford line and the North Downs Line 6¼ miles (10 km) west of Guildford. 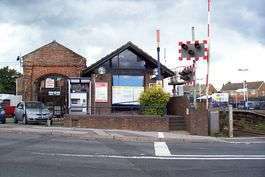 There is a Level Crossing south-east of the station. 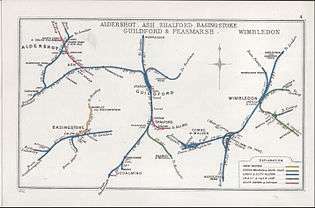 Opened by the Reading, Guildford and Reigate Railway, then operated by the South Eastern Railway, it became part of the Southern Railway during the Grouping of 1923. The station then passed on to the Southern Region of British Railways on nationalisation in 1948. The station had four platforms when it was built, which were later reduced to two after the second world war. The other two platforms were placed over where the station car park and the Network Rail offices now stand. The station is 49 miles 18 chains (79.2 km) from Charing Cross (measured via Redhill); platform 1 can accommodate an eight-coach train, but platform 2 only accommodates four coaches. To the east is the former Ash Junction, 48 miles 34 chains (77.9 km) from Charing Cross, where the former route via Tongham left the North Downs Line 35 miles 50 chains (57.3 km) from Waterloo (via Worplesdon and milepost 30 1⁄4 at Guildford). South West Trains services between Guildford & Ascot are run using a four carriage Class 450 or 458 and 2 cycles can be carried per train. After mid-spring 2014 train services will begin to be operated by 456 allowing the Class 450's and Class 458's to be used elsewhere on the South West Trains route. The Reading to Redhill & Gatwick Airport service is operated by Class 165 Diesel Multiple Units. ↑ Yonge, John (November 2008) . Jacobs, Gerald, ed. Railway Track Diagrams 5: Southern & TfL (3rd ed.). Bradford on Avon: Trackmaps. map 23. ISBN 978-0-9549866-4-3.